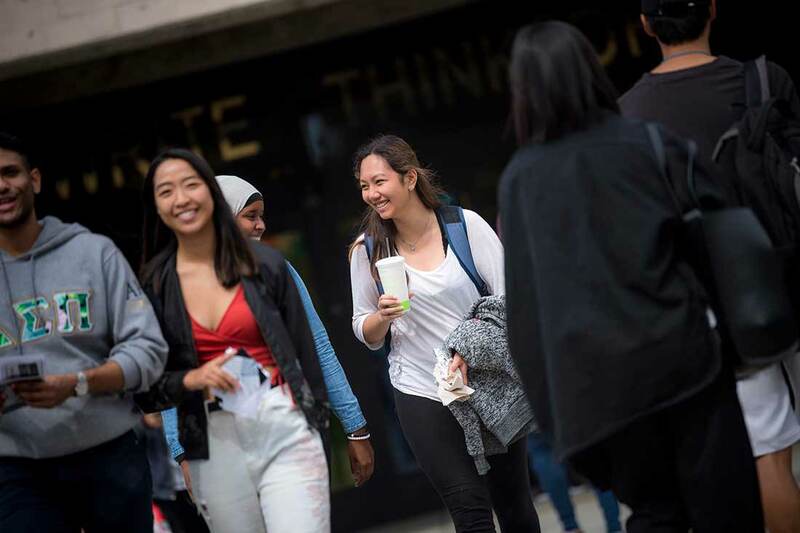 “I’m most excited about meeting new people, trying new things and getting out of my comfort zone,” said UC San Diego freshman Lizzeth Serna, who started the fall quarter Sept. 24 along with 37,000 other students. The Marshall College student is pursuing a theatre and dance major to explore her love of acting and, like much of the new class, is the first in her family to attend college. Preliminary data shows that of the 9,829 incoming freshman and transfer students, 37 percent are the first in their family to attend a four-year college and 40 percent come from low-income households. With the majority of new students having graduated at the top of their class, the freshmen bring a grade point average (GPA) of 4.07 and average SAT score of 1890. Additionally, the average GPA for new transfers this year is 3.47. 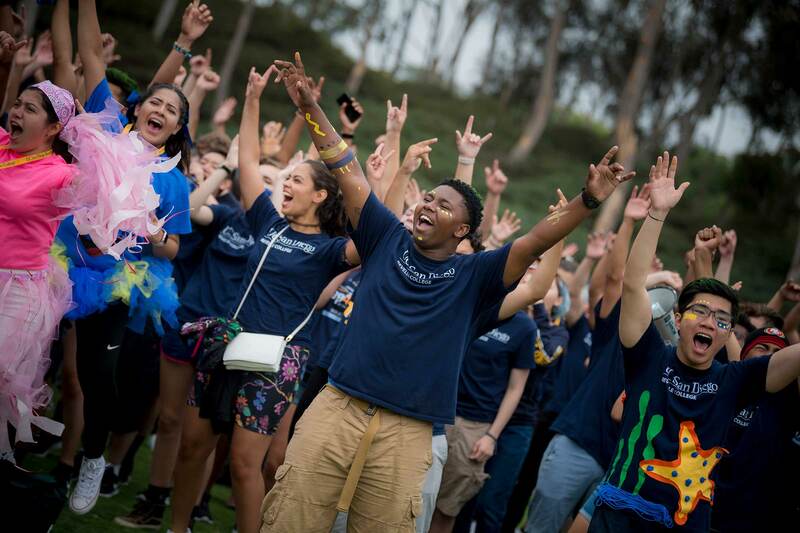 UC San Diego met all housing guarantees for incoming freshmen and transfers. The incoming class have declared majors across 45 academic departments in the arts and humanities, social sciences and STEM fields. Of the approximately 6,600 incoming freshmen, 91 percent live on campus, as do one-third of the 3,000 first-year transfers. An estimated 38 percent (or 15,800 undergraduates and graduates) reside on campus and, with additional housing being built, more students are expected to live on campus in the future. The North Torrey Pines Living and Learning Neighborhood, which is under construction, will open in 2020 with 2,000 undergraduate beds. Additional projects include Nuevo West (808 beds) and East (1,356 beds), which are also scheduled to open in 2020 and will house graduate students. All incoming students have several campus initiatives and offerings to look forward to this academic year. These include new spaces for students to relax and recharge in between classes as well as programs that will help see them across the graduation finish line or get around campus. Price Center recently unveiled Y Más, a beautiful new space inspired by modern courtyards in Mexico, complete with bold colors, lush plants and lively music. The venue features two pop-up vendors. Su Pan Bakery, a family-owned authentic panaderia from San Diego, sells made-from-scratch pan dulce, conchas, galletas, cochinitos, flan custards, fruit tarts and more. In addition, students can enjoy Blackbird Beverages­­—a family owned company featuring specialty grade nitro cold brewed coffee and flavorful kombuchas on tap. Students can also better meet their dietary needs through new and delicious offerings from Housing, Dining and Hospitality (HDH). All dining halls have expanded vegetarian and vegan options and HDH menus now feature allergen icons. 64 Degrees will have more gluten-free options, breakfast is being served at ROOTs, and students can meet for Sunday brunch at Ocean View Terrace. Brunch plates include smoked salmon eggs benedict, sweet potato/kale scrambles and more. Soda and Swine will soon open its doors winter quarter. Located in the space formerly occupied by Porter’s Pub and run by UC San Diego alumnus and culinary visionary Arsalun Tafazoli, ’06, the gastropub will be the third Soda and Swine operating in San Diego. Tafazoli runs a cadre of community-centric restaurants around town including Neighborhood, Noble Experiment, Polite Provisions, Craft and Commerce, Ironside and Underbelly, as well as Born and Raised. To be a part of his alma mater’s efforts to enhance the student experience “is a beautiful thing,” says Tafazoli. Additional venues on the horizon for the campus include a burger/pizza eatery at the northeast entrance to Price Center Plaza. The restaurant location and surrounding outdoor areas area will be renovated and expanded to enhance community gathering. The Chancellor’s Associates Scholars Program: Also known as CASP, the program welcomed its largest class of incoming students—a record 240 new freshmen and transfers. This is a sharp increase from last year’s group of 201 new students. In addition to scholarship and financial aid support, these talented, local students are provided with academic support, mentorship, career advising and more. The program also added two additional high schools to its roster of local partner schools: Hoover High School and e3 Civic High. The Student Success Coaching Program: With 500 new, first-generation students who joined the program this fall, the initiative has grown significantly. Additional coaching staff have been added to accommodate more students, as it now serves a total of 1,300 new and continuing undergraduates. The program helps scholars achieve their goals by connecting students to high impact experiences such as student involvement, faculty interaction and more. Triton Research and Experiential Learning Scholars: All six colleges have launched a program designed to get more underrepresented, first-generation and low-income students involved in research and other kinds of experiential learning. The program, called TRELS (Triton Research and Experiential Learning Scholars), will offer research stipends as well as additional support for research supplies, travel costs and more. Students who want to get involved can contact their college or the campus’s Academic Enrichment Programs office. 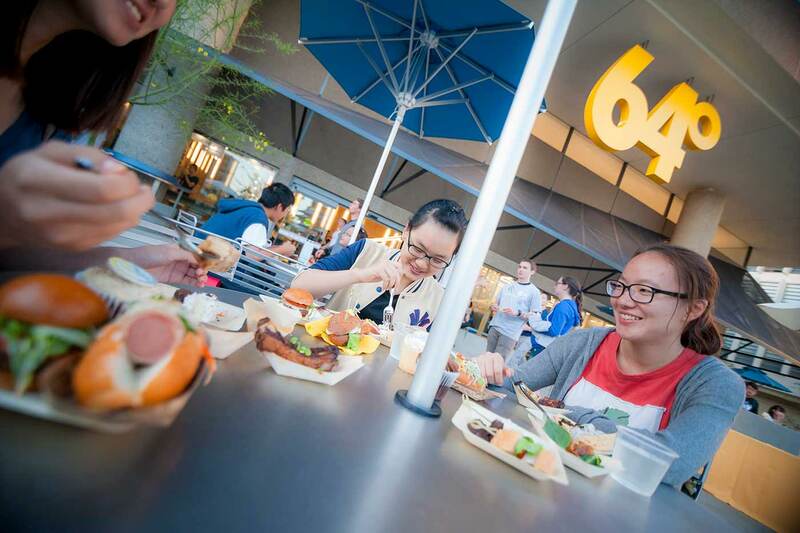 New first-generation website and listening station: The campus has also re-launched the Triton Firsts website, which will serve as a portal connecting the first-generation community at UC San Diego. In addition, the campus is unveiling a mobile listening station where first-generation students, faculty and staff can record their stories, to be archived on the site. The listening station is designed to capture best practices navigating UC San Diego, and to inspire the campus community to learn about the experiences students go through when they are the first in their immediate family to attend a four-year university. Additionally, the Triton Firsts initiative will convene a committee of campus stakeholders to plan a campus wide celebration for National First-Generation Day on Nov. 8. The Undocumented Student Services Center: With additional space, more staff and a new fellowship program, the center will be able to better meet the needs of undocumented students on campus. The center has added a conference room to its space atop the fifth floor of the Student Services Center complex. In addition, the center recently welcomed Christian Abigail Gonzalez as the new Undocumented Student Services assistant coordinator. Gonzalez comes from the University of Colorado Boulder, where she was a counselor in the Office of Financial Aid, working with underrepresented and first-generation students. The center also has launched a new fellowship program to ensure DACA students get valuable job experience as students and alumni. Interested students should contact the center for more details. Osler Parking Structure: UC San Diego recently unveiled its most technologically-advanced parking structure to date, the Osler Parking Structure. With 1,300 additional parking spaces added, the structure also supports the university’s alternative transportation efforts with more electric vehicle (EV) charging stalls than any other structure on campus. Osler contains nearly 500 student parking spots, more than 525 staff parking spots, and more than 150 faculty parking spots. Additionally, of the student spaces, 50 spots will be dedicated to a new program that reserves spots for two- and three-person carpools. First Aira-Enabled University in U.S.: UC San Diego recently launched a groundbreaking initiative providing blind and low-vision members of campus community access to pioneering accessibility technology that at no cost will help them better navigate the campus. Aira is an alumni-founded startup that leverages wearable technology, artificial intelligence and live, human agents to deliver real-time visual description to seeing-impaired students, staff and faculty.